KIEV, Ukraine -- Ukrainian authorities attacked the previous government of Yulia Tymoshenko by releasing an international report that alleges several hundred million dollars were misspent during her term. 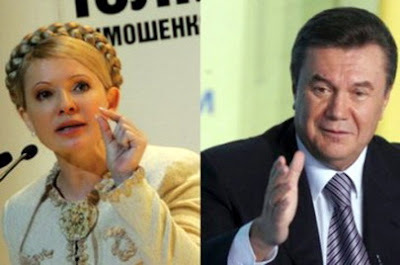 The Ukrainian authorities raised their attacks on the previous government of opposition leader Yulia Tymoshenko (L) to an international level. The Ukrainian authorities raised their attacks on the previous government of opposition leader Yulia Tymoshenko to an international level on Oct. 14, when an all-star team of U.S. lawyers and investigators released a report alleging that several hundred million dollars were misspent during her latest term as prime minister, from the start of 2008 to March 4. The 176-page report by two U.S. law firms, Trout Cacheris and Akin Gump Strauss Hauer & Feld, as well as detective firm Kroll, suggested that members of Tymoshenko’s government made big bucks from kickbacks and money laundering using foreign shell companies. The investigation also alleges that the ex-prime minister’s team diverted state money to her presidential election campaign, which she lost to President Viktor Yanukovych on Feb. 7. The firms – known for their work protecting the images of some of Yanukovych’s business and political allies in the past – were hired by the Ukraine’s government to audit their predecessors. The investigators and Yanukovych’s government touted the report as evidence of his commitment to fighting Ukraine’s endemic corruption. They said it represents the first serious attempt to get to the bottom of graft in a country that hears many corruption allegations among politicians, but has seen no high-level conviction. But the opposition claims the investigation is a smear campaign aimed at discrediting Tymoshenko and her allies. They say it is the latest in a string of attempts to clamp down on critics and opponents of Yanukovych, who they say is taking Ukraine on an authoritarian path. The report doesn’t name Tymoshenko, but investigators made clear that they considered her to be at the center of many allegations. The investigators blamed Tymoshenko’s government for misappropriating taxpayers’ money when buying sugar, vaccines, importing cars and even selling carbon credits to other countries. In one of the more serious allegations, the report claims that 200 million euros out of the 320 million euros Ukraine received for selling Kyoto protocol carbon credits were spent on pensions instead of being used exclusively to finance environmental projects. Two lawsuits have already been filed in the West in connection with the results of the investigation. The Ukrainian Emergency Ministry on Oct. 11 filed a lawsuit in a court in the United Kingdom against British firm Legal Business Consultants accusing it of being a part of an international conspiracy allegedly involved in the sale of 27 depreciated medical vehicles to the ministry at inflated prices. In the end the cars were allegedly decorated with Tymoshenko banners and used during her electoral campaign. On Sept. 17 Ukrvaktsina, a state-run entity within Ukraine’s Ministry of Health, filed a court action in a U.S. court charging Ukrainian firm Interfarm, along with U.S. based Olden group, of selling overpriced vaccines to Ukrvaktsina, linking the conspiracy to the Tymoshenko government. Hryhoriy Nemyria, a former deputy prime minister and a close adviser to Tymoshenko, said the report is politically motivated. He denied large-scale corruption in the government, but said he couldn’t comment on the specific cases until he had studied the accusations more thoroughly. “Instead of reforming the Ukrainian economy they are engaged in a witch hunt of the opposition. We denounce these findings. They are obviously politically motivated,” Nemyria said. Nemyria pointed out that these firms had only looked into the work of Tymoshenko’s government, and not Yanukovych’s from 2006-7. The representatives of the three firms that did the report denied this to be a witch hunt and said they do not have any agenda behind. Kroll and Akin Gump are not new to Ukraine. After the murder of journalist Georgiy Gongadze, Kroll was hired in 2001 by then-President Leonid Kuchma’s son-in-law Viktor Pinchuk to probe the case. In the end the firm issued a report saying Kuchma wasn’t involved, which was widely viewed an attempt to absolve him from suspicion arising from alleged discussions he had with senior officials about dealing with the journalist. At times these firms have pressured investigative journalists who write stories about both Ukrainian businessmen by threatening to file lawsuits against them. Both Kroll’s and Akin Gump’s representatives said they have clients around the world but denied having any conflict of interest in this investigation and added that in their findings there were guided by facts. While normally such cases are handled by the Ukrainian domestic state prosecutors and investigators, in this case the government decided to add more international flavor – and legitimacy – to that by filing the lawsuits to western courts that bear more credibility than Ukrainian ones. Volodymyr Fesenko, director of the Kyiv-based Horshenin Institute think tank, said the new government is looking to create an image for itself as an anti-corruption crusader, as well as to discredit the opposition. The report doesn’t mention Tymoshenko or any of her top lieutenants, but investigators left no doubt as to who was the focus. “In our report one can see a list of transactions that lead to Tymoshenko,” said Mark Macdougall, a partner at Akin Gump, at the press conference in Kyiv on Oct. 14. “I think we’ll hear some names down the road. And that’s when politics will start.” said Fesenko. When asked how much tax payers’ money was and will be spent on the U.S. lawyers and investigators, Plato Cacheris with Trout Cacheris law firm said “it was much less than the money stolen” and would not elaborate further.